Resolutions, like china shops near bull rings, are destined to be smashed, so it was just a need to revive my more healthy activities that drove me to the top of Montaña Roja in El Medano two days into 2016. 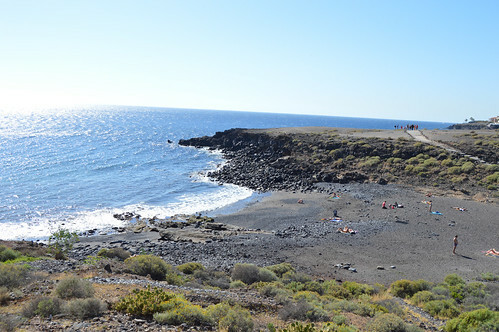 It’s a good job I checked, there are a lot of changes going on along the Granadilla coast of Tenerife. 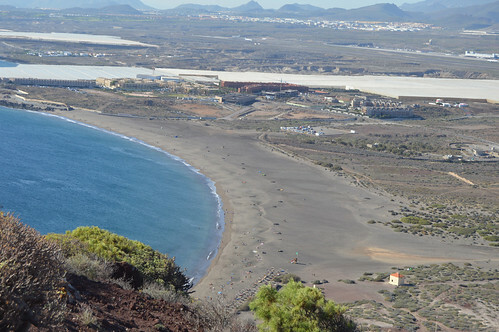 I thought I’d take a good run up at Red Mountain so I got the bus to Los Abrigos to walk the 6 kms to El Medano. With a glorious clear blue sky to spur me on, and a spring in my step, I cut down to survey the pocket beach of Playa Grande, despite being a Saturday in the height of holiday season it was almost deserted. 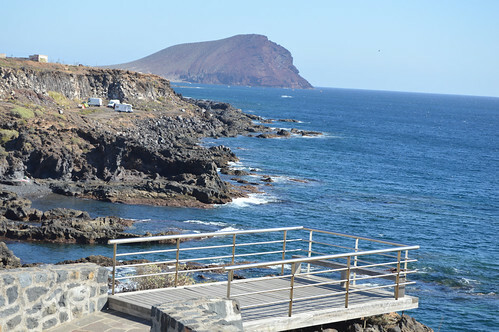 In the past I have walked from Las Galletas, through Golf del Sur and San Blas before reaching Playa Grande and beyond, it’s a well used route. Satisfied that all was well I made my way past the promenade of fish restaurants and up to the TF 643 main road. My red target was already looking wonderful as I viewed it from one of the recently created mirador viewpoints. The rugged coastline stretched out ahead with a track just back from the shore where cars and motor homes had been parked up for fishing and bathing. There were a fair few other walkers stretching their post Christmas legs and further on nudists were using stone semi circles as wind breaks. El Confital is the first expanse of open beach rather than just rocks, pets are allowed here and several pooches were taking a dip. There’s a point where the banana plantation covers seem to signal the end of the track but a cut through leads to a long stretch of path between the sea and the ripening fruit. As I emerged onto the start of the extensive Playa la Tejita I noticed a new gray building up near the road. Behold a new commercial centre, CC La Tejita, had appeared just ahead of the closed down camping site and café. Clearly only a few months old, the centre still had some empty locals but offers car parking and an interesting mix of shops. A bar caught my eye, Beers (written in the same style as the American comedy Cheers) had three cabinets of imported booze, I even noticed some Hobgoblin, but they weren’t opening until 6 pm, just as well, but I will have to return, purely for research. I asked the owner about the recently approved five star hotel and he pointed out a plot of land between the centre and the beach. La Tejita Luxury Beach Resort will cover a 26,000 square metre site, have 136 double rooms, and 33 suites, work is due to start in the second quarter of 2016. 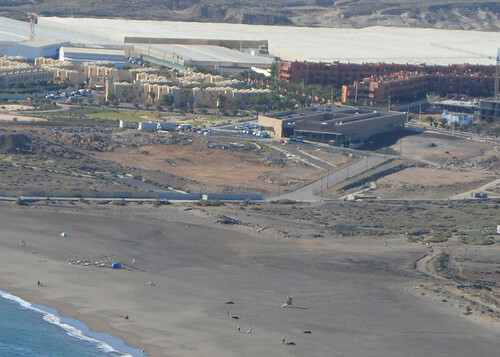 It’s going to make a big impact on El Medano, hopefully it wont ruin the charm, I believe it is to be fairly low rise, and it is behind this big sweep of natural beach. 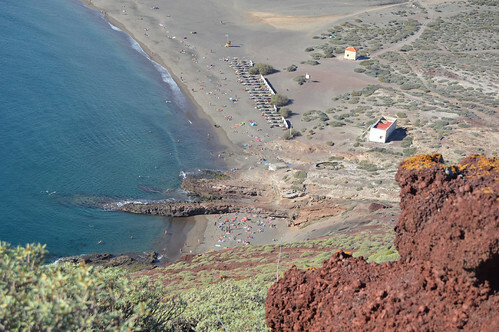 Despite the hotels name, they wont be able to seal off a section of the beach, that’s not allowed under Spanish law, even Abama Hotel in Guia de Isora couldn’t impose that. Sun beds, bars, and food can be provided just for hotel guests but other people can still use the beach. 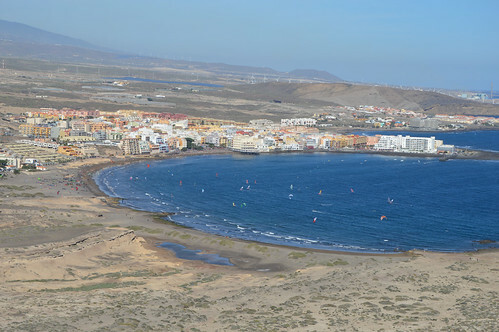 There will be a major boost to trade in El Medano even if most people are all inclusive, Palicio de Isora has certainly had a knock on for Alcala as it’s easy to walk from the hotel to the village. 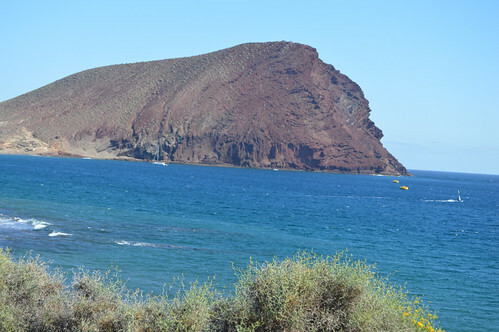 It was an interesting distraction but my goal was near now, taking the signed track opposite Hermano Pedro’s Cave I started the ascent up the back ridge of Montaña Roja. The fine red dust and stones make it a crunchy and potentially slippy walk but with a bit of care it’s not difficult. 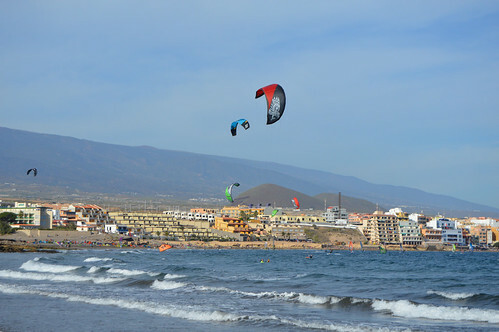 The sand dunes and Playa El Medano to the east were busy with kite boarders cutting through the sky as they skipped over the waves. 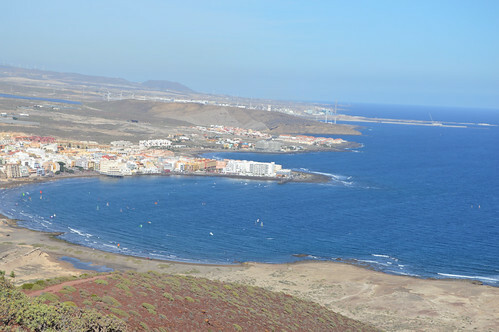 The views just get better as you get higher, further to the east the new arm of the Granadilla port is steadily growing and the sea was twinkling under the glare of the January sun. I always expect to see an army of plane spotters perched on the dusty track, you can nearly reach out and touch the mighty iron birds as they take off and land at Reina Sofia airport. The peak is only 171 metres high, just over an hour up and down, but it delivers some fantastic views and there’s room to sit and ponder at the top. 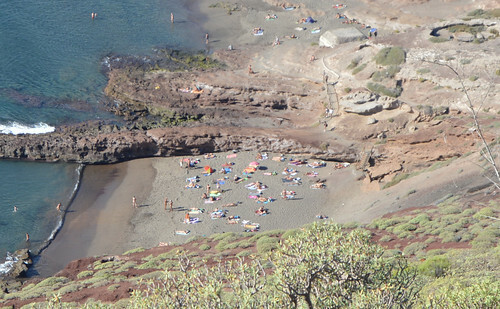 Just down below is the small, secluded part of Playa La Tejita where the nudists throw caution, and their clothes, to the wind. Change is certainly coming but looking at the vast spread of La Tejita and the sparse amount of people peppering the sand below, there is plenty of room to wedge a few more towels in. Looking down I could see the small car park overflowing as always and cars wedged against the side of the road. The protected reserve below still attracts a bumper crop of resident and migrating birds, and the beaches lure wind and kite surfers in flocks. El Medano will carry on unruffled, as for me, the three hour trek has put me right back on track.